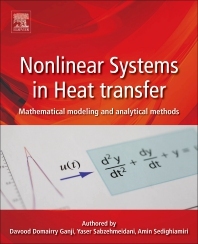 Nonlinear Heat Transfer: Mathematical Modeling and Analytical Methods addresses recent progress and original research in nonlinear science and its application in the area of heat transfer, with a particular focus on the most important advances and challenging applications. The importance of understanding analytical methods for solving linear and nonlinear constitutive equations is essential in studying engineering problems. This book provides a comprehensive range of (partial) differential equations, applied in the field of heat transfer, tackling a comprehensive range of nonlinear mathematical problems in heat radiation, heat conduction, heat convection, heat diffusion and non-Newtonian fluid systems. Providing various innovative analytical techniques and their practical application in nonlinear engineering problems is the unique point of this book. Drawing a balance between theory and practice, the different chapters of the book focus not only on the broader linear and nonlinear problems, but also applied examples of practical solutions by the outlined methodologies. Professor of Mechanical Engineering and the Director of the Graduate Program at Babol Noshirvani University of Technology in Iran, as well as a consultant in nonlinear dynamics and the Dean of the National Elite Foundation of Iran. He has a Ph.D. in Mechanical Engineering from Tarbiat Modarres University. He is the Editor-in-Chief of International Journal of Nonlinear Dynamic and Engineering Science, and Editor of International Journal of Nonlinear Sciences and Numerical Simulation and International Journal of Differential Equations. His research interests are Finite Difference Method, Finite Volume Method, Inverse problem, Fluid mechanics, Aerodynamics, Analysis Differential Equation (P.D.E), Spray Modeling and Analytical techniques in Nonlinear Dynamics. Graduated as PhD in Mchanical Engineering from Universiti Teknologi Malaysia (UTM), where he worked on intelligent control of in-pipe application of micro-robot actuated by voice-coil actuators. His research interests are solving nonlinear mechanical problems, intelligent control methods and analyzing diferential and partial differential equations in engineering problems. He has several publications in peer-reviewed journals and conference publications in these areas. Holds a PhD degree in Mechanical Engineering from Eindhoven University of Technology in the Netherlands, during which he focused on establishing a mathematical model between microstructure of semicrystalline polymers and their mechanical properties. His areas of interest are mathematical modeling, nonlinear systems in engineering problems, analytical and numerical analysis of nonlinear differential and partial differential equations, heat transfer, modeling and simulation, finite element analysis and computer-aided engineering. He has several publications in various peer-reviewed journals and several conference presentations. He served as reviewer for different journals and is an editor of the International Journal of Nonlinear Dynamics in Engineering and Sciences (IJNDES).